Right now I’m writing a fantasy book in journals, and as counter-intuitive as it may seem, I think the process is a lot faster for me in a journal than it would ever be trying to write the first draft in a computer word processor. So far I’ve filled up two journals and am around the 25% mark on the third journal. This is the first journal I filled up. I loved it. It has a nice feel to it and I like the simple design. The cover was nice and smooth. Very good quality for the price, too. 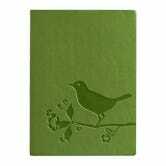 I can’t find a picture of the second journal on the Internet - and I’m at work, in a slow period, so I won’t torture you guys with bad photography of the actual journal - but it was another bird-themed journal that I picked up at Staples because I liked how sparkly it was. As you can guess, it was just a little bit gaudy. The paper quality wasn’t as good but I developed a fondness for it all the same. My current journal won’t have a picture, either, because it’s actually from China - a gift given to me by a Chinese friend of the family. I like the uniqueness of it but I don’t think I’ll use a journal like it again when I’m done with it. The paper is not lined and it’s bound by string. As you can imagine, it’s harder to write without lines and the string binding sometimes comes apart in my purse (I’m a big fan of journals because I can write anywhere, anytime, so long as they fit in my purse) so I have to pull the string tight together again. So far it hasn’t come apart completely...but it is worrisome. When I’m finished with the Chinese journal, I already have the next journal waiting for me. I love this journal. It’s beautiful. The only problem is that I’m not quite sure it will fit in my purse. The pages are edged with fake gold and it’s just beautiful. Again, a journal that edges a little towards gaudy but I can’t help it, I just love the colors. It would keep in with the bird theme. Seems to be the right size, has lined paper, and I’m excited to try out the magnetic clip: I find those to be very satisfying. Does anyone else share my love of journals? Any journal recs for me? Feel free to talk about other weird things that you collect - not sure if journals is a big enough topic/has a big enough fanbase here to support a thread.